Laura Trott and Sir Chris Hoy claimed Team GB's 21st and 22nd Olympic gold medals respectively in the Velodrome. It was Hoy's sixth gold medal, which makes him Britain's greatest Olympian. First chance to check my messages, what can I say except thank you to all of you, so kind! Still buzzing from yesterday, what an experience! Chris Hoy speaks to ITV News' Sports Editor Steve Scott about the final seconds of his historic race win, which secured his sixth Olympic gold medal. Early indications show a peak audience of 10.1m watched Chris Hoy win his latest gold medal on Tuesday night. Laura Trott has revealed that she promised to buy her sister Emma a car if she won two golds at the Games. Giggling, Trott told BBC Breakfast: "I hope she's got a budget, there'll be no Ferraris, I'm telling you." Talking about the future as she appeared on the sofa with six-time Olympic champion Sir Chris Hoy, Trott joked: "I could beat him, eh?" 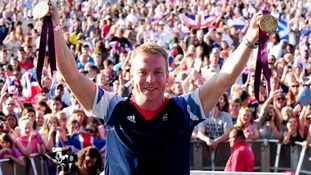 Sir Chris Hoy has told Daybreak he is hoping for a "dream end" to his career at the Commonweath Games in Glasgow in 2014. Double gold medallist Laura Trott, 20, also told the show how she is lucky to be alive after she was born a month prematurely suffering from a collapsed lung, leading to six weeks in intensive care. The moment Jess Varnish and Victoria Pendleton sped to a team sprint world record, only to face the heartache of being disqualified, was the most memorable performance of the Games for Team GB cycling chief Dave Brailsford. "For them to be the first riders on the track. They got disqualified and it is really, really sad for Jess. "She should take an enormous amount of pride that she got up on this track and was the first British rider with Vicky and they delivered a world record - that just set everybody up. "That is the very thing that I will remember." Sir Chris Hoy has spoken to ITV News about his triumph in the Men's Keirin Final on Tuesday. He said he had been "blown away" by the whole day and it was "the greatest experience of my whole career". He added: "This is what you train for, and aspire to achieve but when you actually do it is very hard to take it all in." Victoria Pendleton spoke to ITV News after coming second in the Olympic sprint final to Australia's Anna Meares. It was her last ever race before she retires. She said that she was happy with her silver and earlier gold medal for the keirin. She added that it was definitely the right time to bow out, saying "it was an amazing atmosphere in there [The Velodrome], I'll never experience anything quite like it again." Yeeeea! What a day at v'drome to finish off a spectacular olympics! @chrishoy @lauratrott31 @v_pendleton all brilliant!! Go GB!